"This is some simulation." There's a new trailer for a science fiction film called 400 Days, but it's actually a Syfy Film that is getting a full theatrical release in January. Turned out better than they were hoping, maybe? 400 Days is from writer/director Matt Osterman and is about a "social experiment" where a small crew of astronauts embarks on a deep space mission to another planet where the travel time is 400 days. Essentially, can they live together in isolation in deep space for that long? The feature film stars Brandon Routh and Caity Lotz, Ben Feldman, comedian Dane Cook, Tom Cavanaugh and Grant Bowler. This definitely looks Syfy cheesy at times, and overly horrific by the end, but I'm still curious to check it out. 400 Days is a psychological sci-fi film centering on four astronauts who are sent on a simulated mission to a distant planet to test the psychological effects of deep space travel. Locked away for 400 days, the crew's mental state begins to deteriorate when they lose all communication with the outside world. Forced to exit the ship, they discover that this mission may not have been a simulation after all. 400 Days is both written and directed by filmmaker Matt Osterman (of the Syfy film Ghost from the Machine previously + work on "RoboSHOT"), produced by Gabe Cowan and John Suits. 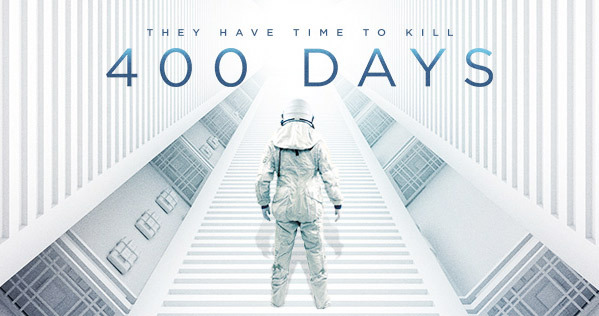 Syfy Films will release 400 Days both in theaters + VOD starting January 12th, 2016 in a few months. If you're interested, visit the official website. Who's in? I thought every hated Dane Cook. How do he still get work? because he's a very good actor. and you're just a dickhead. form your own opinions, don't follow what others say. loser. No one is a loser! Already free online. I watched the beginning and it didn't look that bad. I might watch the rest when I am bored and can't sleep. Cool. It is most surely a game scenario, but the ride looks engaging and fun. Dane Cook does not look super terrible (but still somewhat terrible). lol Jared Leto Joker cameo at the end there But in all serious, this looks interesting. I love Routh, don't hate Cook. Love Tom Cavanaugh. I watched this online the other day, and frankly it started off pretty interesting, and then descended into completely terrible by the end. 90 minutes of my life that I want back. Just for once, it would be cool if it all worked out. More like a Psychological Horror with sci-fi touches, and it certainly isn't in 'Deep Space' (except if there's a twist that it actually is?). Routh, Lotz and Cavanaugh. Seems like this film has a CW superhero pipeline.